I have to be honest in prefacing this post; I haven’t been feeling the Christmas spirit too much this year. Maybe it’s because it’s my first time away from home during the holidays (gotta admit, Thanksgiving was kinda sad, though we did have a successful turkey dinner to make up for it), or maybe it’s the lack of snow, which I associate with winter and Christmas. While I notoriously hate on the snow (driving, shoveling, generally just dealing with it isn’t something I enjoy – living in Buffalo definitely instilled a deep seeded resentment of snow in me), now that it’s not here, I miss it. It is nice to sit outside in the park in a sunny day with only a light jacket on and not freeze every time you have to go outside. But there also isn’t the need for peppermint hot chocolate or hot gingerbread tea while cozied up with a blanket watching Christmas movies or making cookies, which I love! So I put in this disclaimer because I’m not sure if it’s Madrid or me that’s not in the Christmas mood, but I have to say that I just don’t think Madrid is a very ‘Christmasy’ city (despite being on National Geographic’s list for best Christmas lights in Europe…first time I’ve disagreed with trusty NG, but I think they’re confusing quantity for quality). Sorry for any Madrileños that I might offend with this post, but I gotta speak my mind! 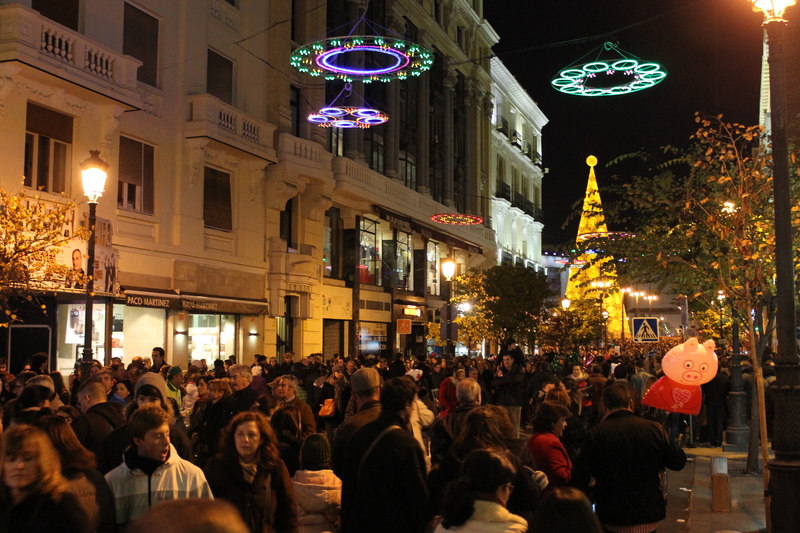 Stay tuned for a post about Spanish holiday traditions in general – they have some really interesting and cool ones! 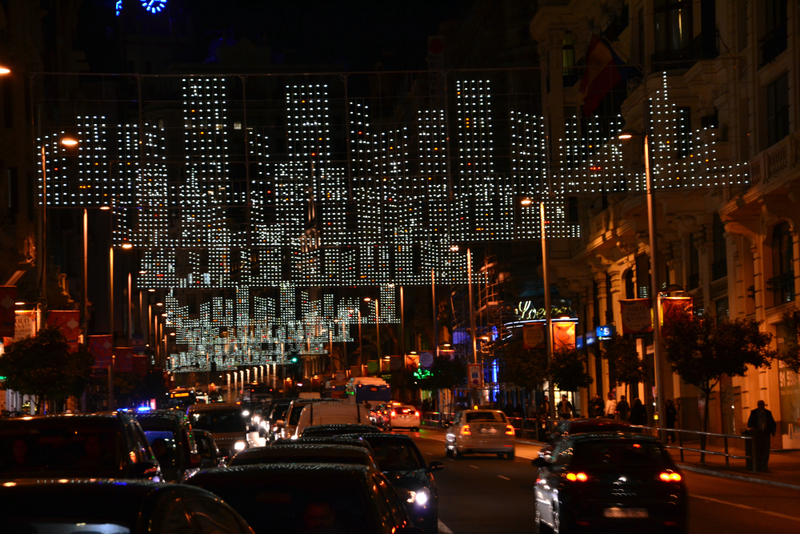 Here I just wanted to share how Madrid specifically is during this time of year. 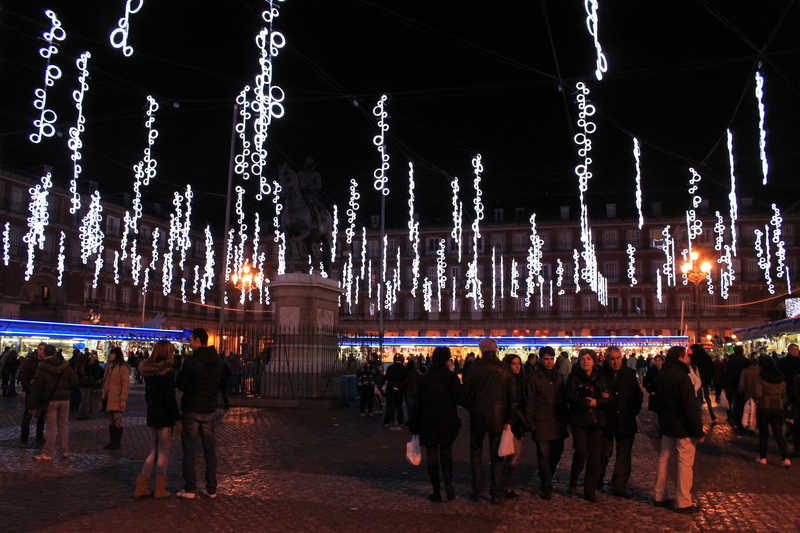 Now I was really excited to see the Christmas Market in Plaza Mayor, or the Main Square, as it was my first Christmas market in Europe! Unfortunately I chose (okay, didn’t really choose, it just kind of happened that way) to go on the Saturday of a long holiday weekend when everyone from the surrounding areas had come into Madrid to partake in the festivities. So the excessive crowds were my fault for not planning better. 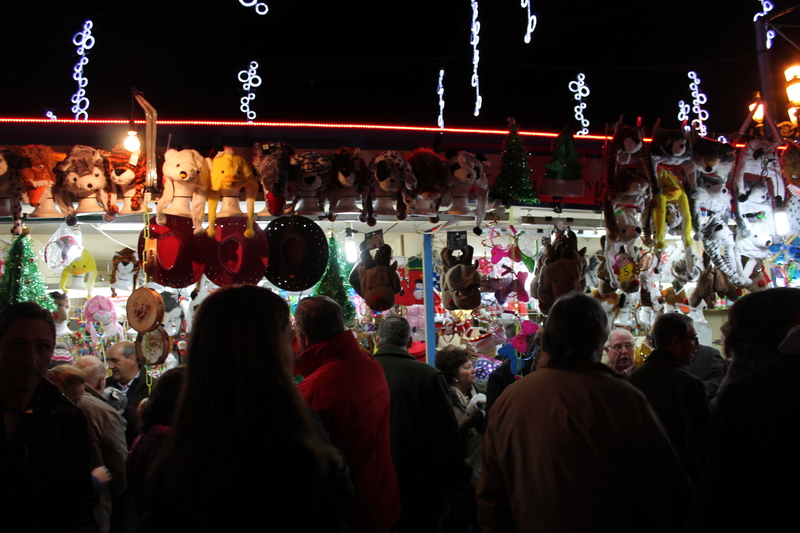 But when I finally reached my destination, I was a bit disappointed to find more of a carnival than a Christmas market. The stalls were mainly crammed with people selling wigs and novelty hats instead of traditional Spanish artisan booths like I expected. I lost count of how many older men I saw wearing bright neon wigs – still don’t understand the deal with Christmastime + wigs. And if you needed any kind of balloon shaped with a cartoon character or an opportunity to take photos with bullfighters, look no further than the market carnival. Also sorely missing from the Christmas market was food, which just truly upset me. There were dessert foods being sold, such as traditional pastries and cakes, but in terms of actual street food, nothing. I’ve never been to a market that doesn’t sell food! What is this!? Okay, this is one place where I might sound like a brat, but I just have to say that a giant, yellow metal cone is NOT a tree. It doesn’t sparkle, it doesn’t twinkle, it just feels cold and neon. 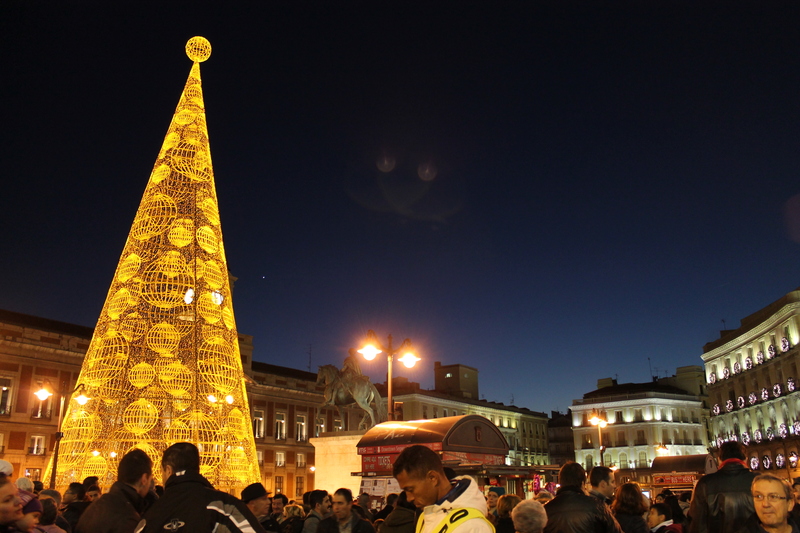 This is the main city ‘tree’ and I’m not the only one in thinking it’s ridiculous (I have some Spaniards on my side with this one, so it’s not just me!). Also, since Vodafone (phone company) basically owns the city of course they have their own Christmas cone affectionately adorned with Vodafone symbols right outside the huge McDonalds on the street known as ‘prostitute street’. YAY CHRISTMAS. Christmas capitalism at its best. Merry Crisismas! What skyline are you?! Definitely not Madrid’s!! What are you even?! Keys, bubbles, what? And why is there a small army of you that feels like it’s going to fall down on me at any second? I like you. You I have no questions for because you make sense. Why didn’t I like the Christmas lights? Do I sound like a Scrooge? Mainly I thought they were too tacky and flashy, I like more understated but elegant lights, and the colorful, flashing, and downright weird lights were amusing but didn’t bring out the holiday spirit in me; it felt more like Las Vegas. 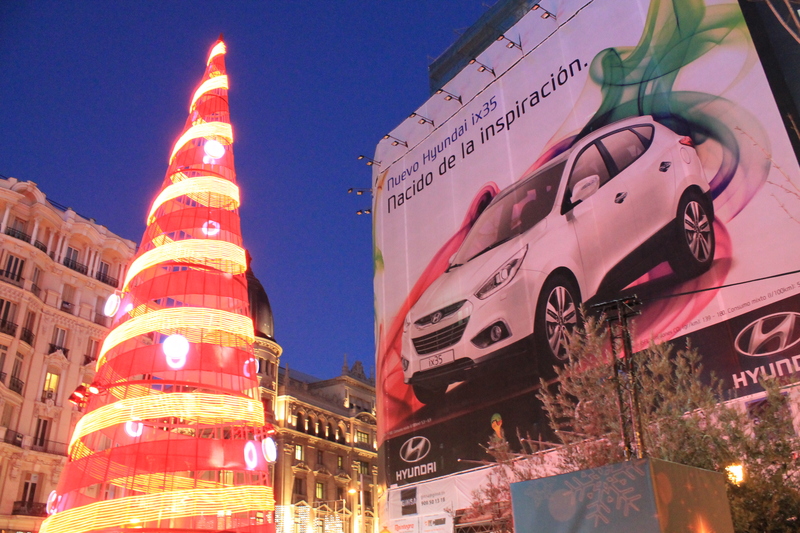 This one was my favorite part of Christmastime in Madrid. 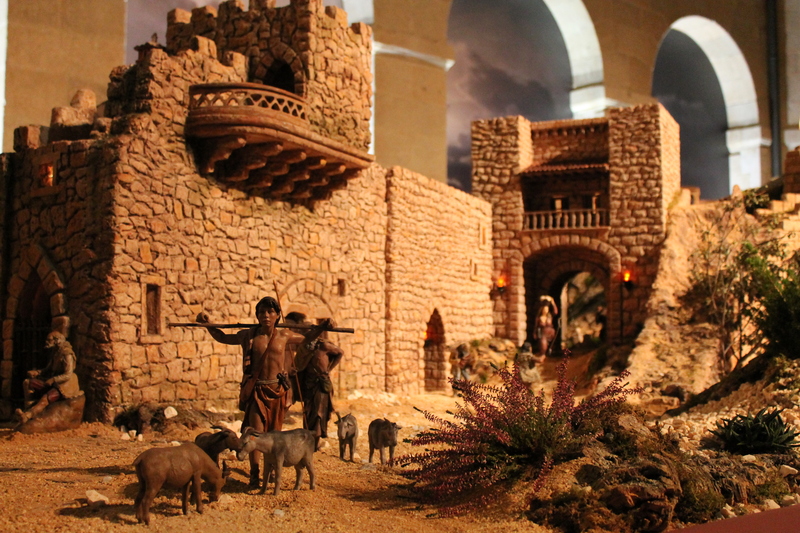 A recreation of Bethlehem on Christmas, it’s a Spanish tradition to build these ‘Belens’ or Nativity Scenes every year. But it’s not just the manger and barn, but the entire town, and it’s pretty damn impressive. What a good little traditional Spanish building on that hill. Of course the holidays are really all about family and those traditions, not about lights and markets. 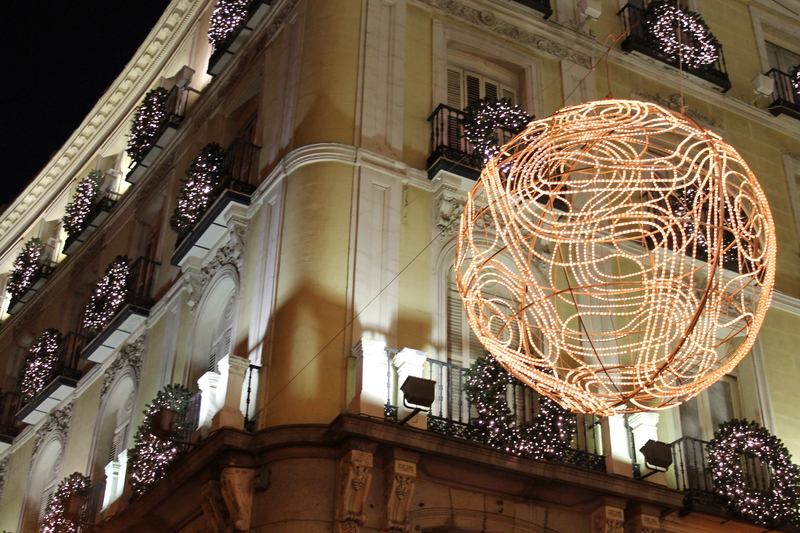 Stay tuned for a guide to the plethora of Spanish holiday traditions coming soon (hint: lots of delicious pastries). Ironically, I actually wrote this from a plane headed to Kraków, before heading up to Warsaw where I am actually going to be spending Christmas. I’m looking forward to seeing how Christmas is celebrated in Poland, where I expect there to be snow! What’s an essential part of the holiday season for you? 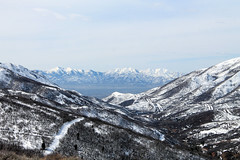 What’s your city/town like during this time of year?